The Mercedes Formula 1 squad has not ruled out imposing future team orders on Lewis Hamilton and Nico Rosberg, but is changing communication methods after the Hungarian Grand Prix controversy. Following discussions between team chiefs and drivers Hamilton and Rosberg in Belgium on Thursday, Mercedes accepted that there were some mistakes made in its handling of the Hungary situation. But despite its drivers' increasingly intense F1 title battle, Mercedes will not get rid of orders completely because there may be scenarios where its men have to help each other. However, Mercedes motorsport chief Toto Wolff made clear ahead of the Belgian GP that it would not be so forceful in its phrasing. "What was being told to Nico was that Lewis was going to let him by, which is probably just not the right wording," explained Wolff about the Hungarian GP situation. "And whether it was driven by instinct, intellect, or following procedures, whatever Lewis said was right in my opinion - that Nico can overtake me and I will not make his life difficult. "That is probably the only thing you can expect from the guy in front. "So we need to choose our words carefully. We must be aware in the heat of the battle. "It wasn't the last time we encountered some controversy between the two and it wasn't the last time we will have to learn and learn on the job." The stance taken by Mercedes, which has effectively backed Hamilton's decision to ignore orders in Hungary, does not appear to have gone down well with Rosberg. 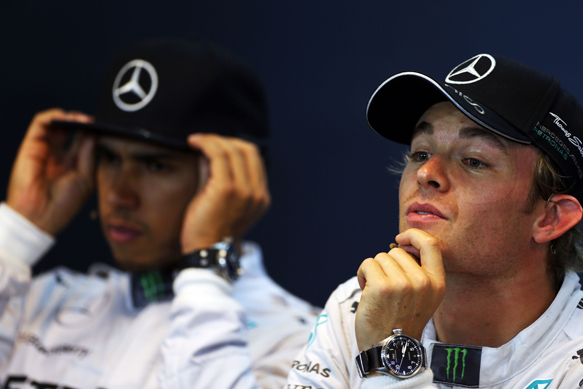 The German again declined to comment about the situation when asked on Saturday, and Wolff said it was inevitable there would be times when one drivers was not happy with decisions taken. "This is not only a race on the track, this is a race off the track as well," he said. "Part of the race is positioning yourself and trying to make sure that you are in the best possible position with the relationships in the team in order to get the best out of the team for yourself. 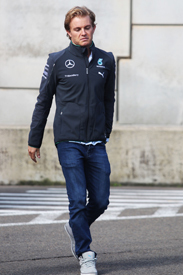 "I think that it is completely normal for the race drivers and any other individual to have ups and downs. "Sometimes you are happier, sometimes you are less happy and for us we need to make sure that we always extract the maximum from both of them. "That is why we want to give them the environment and the support they need to perform at their best. "But we are also not in the 'let's make everyone happy' business. We need to take decisions and, if you take decisions, sometimes it swings to one side, and sometimes it swings to the other side. "What we need to be is always fair, transparent and straightforward, this is the only way we can cope with the situation of having two number one drivers."